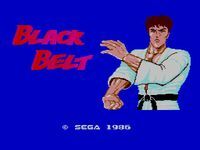 Black Belt is a 1986 beat 'em up game released for the Sega Master System. It is a localization of the Japanese Mark III game, Hokuto no Ken (北斗の拳? ), based on the manga and anime series of the same name (Fist of the North Star in English). The international version was stripped of the Hokuto no Ken license, forcing graphic alterations to the game. Black Belt was one of programmer Yuji Naka's early games prior to his involvement in Sonic the Hedgehog. Source: Wikipedia, "Black Belt (video game)", available under the CC-BY-SA License.